A few years ago, when I was interested in other things like malt whisky, LEGO decided to create a x-cross track for their 9V Train sets. But when the system moved from the 9V Train tracks to the new plastic tracks without electricity the x-cross track disappeared. But cry no more. Miguel is here to help you restore your faith. 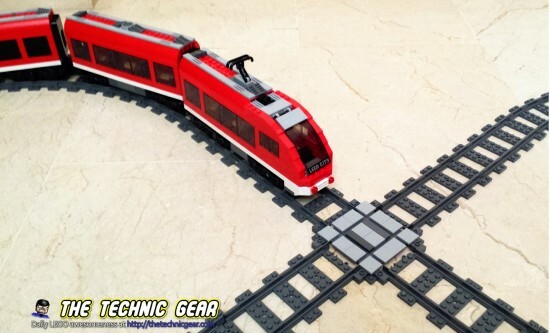 This is a tutorial to build a x-cross track out of common LEGO plates and tiles. I was able to built two of them for around 10€ ( around £8.50 )… if you think that the only way of getting a x-cross track now is using eBay and that it usually goes to 50€-60€… a nice saving. Here is the list of materials that you need. Some of them are mandatory, like the little 1×2 tiles with knob, but others simply make the construction more robust. Watch the video, I built it on real-time so you shouldn’t have problems following me. Enjoy! And if you liked it, please share. Thank you so much. This is EXACTLY what I needed. Great design and how to video. I made a couple of minor changes I thought I would share. I mounted it to a 16×16 baseplate and added a piece of flexible track to each straight length… this made adding track easier. I added a eight 1×1 plates to each corner piece to anchor it from moving. I also added a tile under the offsets as additional support. Good work! Do you think you could share a photo? It is just too expensive. You can buy all the parts to build this x-cross for barely 10$ and glue them if you need extra resistance. Hi. I’m building this exact setup. Great idea, and easy to follow guide. Can anyone give me the dimensions of this track setup? Total length and width. I’m trying to figure out a card table, Christmas tree setup.